black-and-white photograph, 12 3/4 x 19". Any photograph with both Andy Warhol and Marcel Duchamp in frame can hardly avoid being of interest, and Stephen Shore’s black-and-white study of the pair hanging out at New York’s Cordier Ekstrom Gallery in 1965 is no exception. But while sprinkled liberally with the magic fairy dust of art-historical celebrity, it also happens to be a decent picture in formal and conceptual terms. 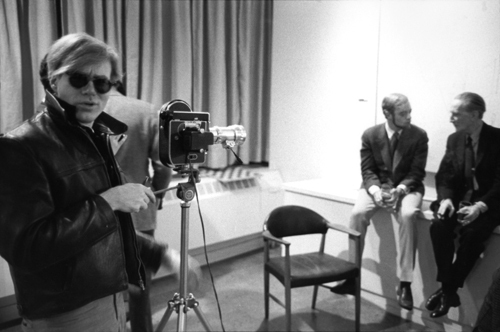 Warhol, standing close to Shore’s lens and behind a camera of his own, turns quizzically in the photographer’s direction while Duchamp chats to then Philadelphia ICA director Sam Green. Like the rest of this body of work documenting the Factory’s heyday, the shot combines an intimate viewpoint with a deceptively casual composition that embodies Shore’s emergent interest in fusing art with everyday life. Other works from “The Velvet Years” sparkle with a similarly effortless glamour. All Andy’s famous friends, from a glacially beautiful Nico to a shades-wearing Lou Reed, are in the house and playing to type—it’s almost too good to be true. A striking snap of Diana Hall training a revolver at Andy’s head seems to anticipate Valerie Solanas’s later and rather more serious attack, but for the most part, the storied studio looks like a twenty-four-hour party, people, the only clouds in the sky made of silver foil. In the rear gallery are two entries from a series of Manhattan street-life panoramas taken in 2000. Time capsules of the most elegant stripe, they focus on the unconscious gestures and expressions of anonymous pedestrians. A noble exercise, but it’s the Superstars who’ll be remembered.